VEGF-A is essential for the development and organization of the vascular system (vasculogenesis) and for both physiological and pathological angiogenesis. Mice lacking even one copy of the VEGF-A gene are embryonic lethals. VEGF-A mediates its complex functions by exerting specific biological activities. universal hyperpermeability of tumor blood vessels. Permeability becomes evident within a minute following injection of VEGF-A protein into skin and continues for approximately 20 minutes. VEGF-A is among the most potent vascular permeabilizing agents known, acting at concentrations below 1 nM and with potency some 50,000 times that of his-tamine on a molar basis. VEGF-A induces venular permeability by its action on endothelial cells, the primary barrier to the extravasation of plasma proteins, but there has been debate about the pathway that circulating macromolecules follow in traversing endothelium. The earlier view had been that vasoactive agents cause endothelial cells to pull apart, creating an interendothelial cell gap through which macromolecules could extravasate. Although supported by data using cultured endothelial cells, evidence for an intercellular extravasation pathway in vivo is not convincing. More recent studies have shown that macromolecules cross tumor and normal venular endothelium primarily by means of a transendothelial cell pathway that involves vesiculo-vacuolar organelles (VVOs) (see Chapter 46 by A. Dvorak and D. Feng for a detailed discussion of VVOs). VEGF-A also induces endothelial fenestrations that provide an additional transcellular pathway for solute extravasation. 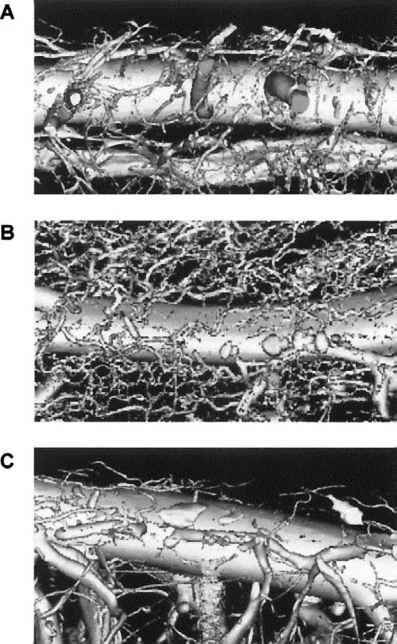 The increased microvascular permeability induced by VEGF-A leads to tissue edema, a characteristic of tumors, healing wounds, and other pathologies in which VEGF-A is overexpressed. Extravascular fluid accumulation is particularly prominent in tumors growing in body cavities such as the peritoneum (ascites tumors). 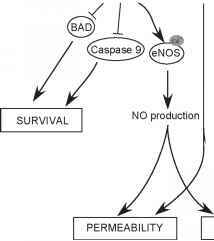 Plasma protein leakage has several consequences. One of these is activation of the clotting system via the tissue factor pathway, leading to deposition of a fibrin gel that retards clearance of edema fluid and results in locally increased interstitial tissue pressure, a characteristic feature of many solid tumors. Deposited fibrin also provides a provisional stroma for endothelial cell and fibroblast migration that supports the angiogenesis and fibrogenesis necessary for generating mature stroma (desmoplasia in the case of tumors or scar formation in wound healing). VEGF-A has multiple effects on vascular endothelium that become apparent over the time frame of hours to days. These include striking changes in cell morphology and cytoskeleton, accompanied by stimulation of endothelial cell migration and division. At the molecular level, VEGF-A reprograms endothelial cell gene expression, causing the increased production of several different proteins, including the procoagulant tissue factor, fibrinolytic proteins (uroki-nase, tPA, PAI-1, urokinase receptor), matrix metallo-proteases, the GLUT-1 glucose transporter, nitric oxide synthase, numerous mitogens, and antiapoptotic factors (e.g., bcl-2, A1, survivin, XIAP). VEGF-A also serves as an endothelial cell survival factor, protecting endothelial cells against apoptosis (L. Benjamin) and senescence. In addition, the Jain laboratory has shown that VEGF-A upreg-ulates the expression of endothelial adhesion molecules on vascular endothelium, including E-selectin, ICAM-1, and VCAM; this favors inflammatory cell attachment and extravasation. Recently, the Ferrara laboratory has identified another activity of VEGF-A, that of paracrine release of hepatotrophic molecules from sinusoidal liver endothelium, a function mediated through VEGFR-1. There is increasing interest in activities that VEGF-A exerts on nonendothelial cells that express VEGF receptors as VEGF-A stimulates monocyte chemotaxis and proliferation of uterine smooth muscle. VEGF-A also has reported effects on lymphocytes, granulocyte-macrophage progenitor cells, osteoblasts, Schwann cells, mesangial cells, and retinal pigment epithelial cells. In development, VEGF-A drives angioblasts and primitive vessels toward arterial differentiation and attracts filopodia of both endothelial cells and neurons, causing these cells to move in the direction of a VEGF-A gradient. VEGF-A receptors have now been reported on some tumor cells, raising the possibility that VEGF-A exerts autocrine effects that enhance tumor cell motility and survival. Acne is a name that is famous in its own right, but for all of the wrong reasons. Most teenagers know, and dread, the very word, as it so prevalently wrecks havoc on their faces throughout their adolescent years.